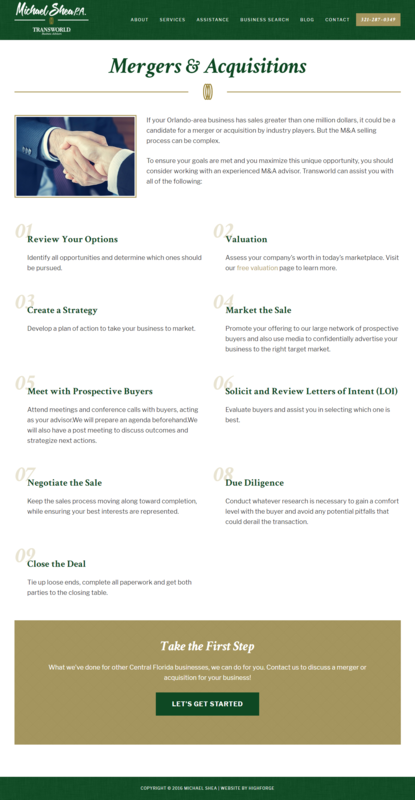 Transworld is a national organization that brokers the purchase and sale of businesses. Michael Shea P.A. is the owner of its Orlando, Florida branch. Transworld is a national organization with numerous branches located around the U.S. Since founding the Orlando, Florida division in 2005, Michael Shea had used a website that mirrored Transworld’s national website. It had much of the same content that not only appeared on Transworld but also on the sites of other regional branches. Michael decided it was time to build his branch’s own identity. He wanted a website that still referenced a connection to the Transworld brand but also spoke to the accomplishments of his individual branch. Michael and his team have closed an impressive $35 million in sold business volume and presided over more than 225 transactions in the past decade. His long-term goal was to broker the purchase and sale of bigger businesses, and specifically complex mergers and acquisitions. 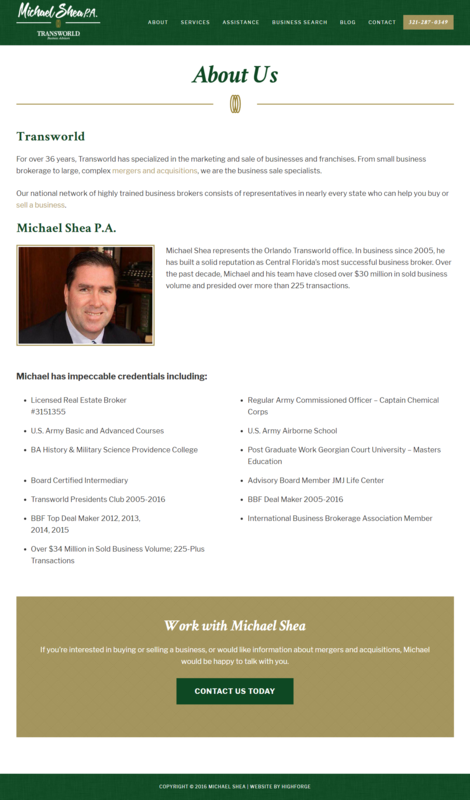 Michael Shea hired Highforge, an Orlando-based marketing firm, to create a new website for the firm. Highforge brought Susan Greene onto the development team to write the site’s content. Susan interviewed Michael and took the time to learn what made his agency uniquely qualified to broker the purchase and sale of businesses. With its remarkable accomplishments, Michael’s branch was a standout in the industry. At the same time, Susan made sure to emphasize the benefits Michael’s clients received from working with a broker connected to Transworld, an established, highly respected and well-connected national organization. Michael was able to give his brand the visibility and notoriety it deserved, while still recognizing its connection to Transworld. In the new website, his credentials, accomplishments and experience were front and center, which is helping him to attract bigger clients, particularly those interested in large-scale mergers and acquisitions. Could a new website help build your brand and attract more customers? Contact Susan Greene to discuss the exciting possibilities!